This bag allows you to store the necessities for a day on the water - life jackets, anchor, rope, camera, food, etc. It fits neatly in the bow and lashes down securely to the hull. 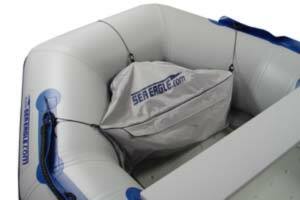 A carry handle is included so you can load up on shore and carry the loaded bag to your boat in one piece.